With the sun beaming down, temperatures in the 80's, and Memorial Day just a few days away, I feel as though summer has already begun. 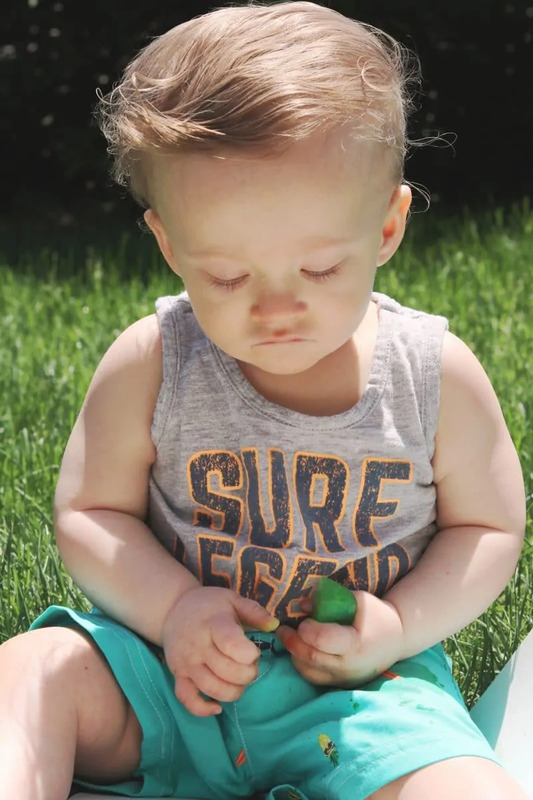 And this summer is especially special for us since it will be the first time Nathaniel really gets to enjoy summer. 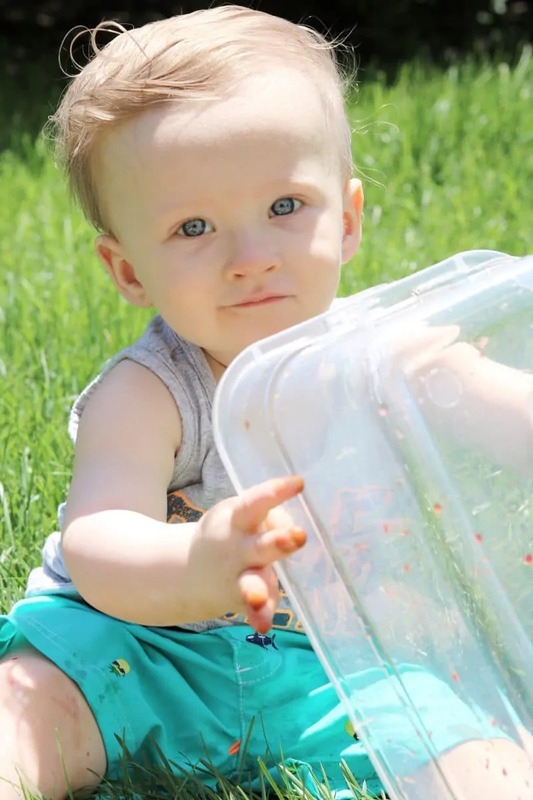 This week, on a particularly hot afternoon, I decided to take Nathaniel outside to enjoy some fun colored ice play. But playing outside is no fun if it results in a sunburn. So before heading out I covered us both head-to-toe with Aveeno® sunscreen. 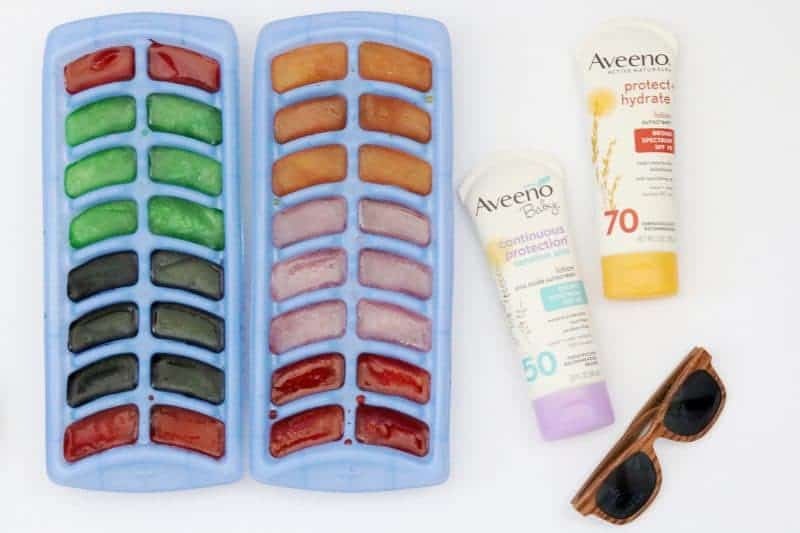 In addition to bringing the supplies for our color ice cube activity outside, I packed a little bag with other necessities such as a sippy cup filled with water, hand and face wipes, and our Aveeno® sunscreen. I placed a sheet of white posterboard down in the grass and put a few colored ice cubes right on it. The brightly colored ice cubes really show up well on the white background, making it easy for my little guy to spot them and grab them. He was also able to glide the melting colored ice cubes around on the posterboard and “paint” a picture. Well, this little guy wasn't much for the painting aspect but he did enjoy “chasing” the ice cubes as they glided around on the poster board. Although Nathaniel did have a chance to play with snow this winter, this was his first time experiencing ice cubes. They were slipping all over and tough for him to pick up, but he was persistent and managed to get them into his little fingers. I was very impressed by how long he squeezed the ice cubes in his little hands to hold on to them. After playing with the ice cubes themselves for a little while he decided to go for the plastic bin that was holding even more ice cubes in it and dump them all out. We enjoyed a little game of peek-a-boo — his favorite game — with the plastic bin. The bin being see-through didn't stop the game from being fun! I reapplied our sunscreen after a while to make sure that we were still being protected from the sun as we enjoyed our time outside. 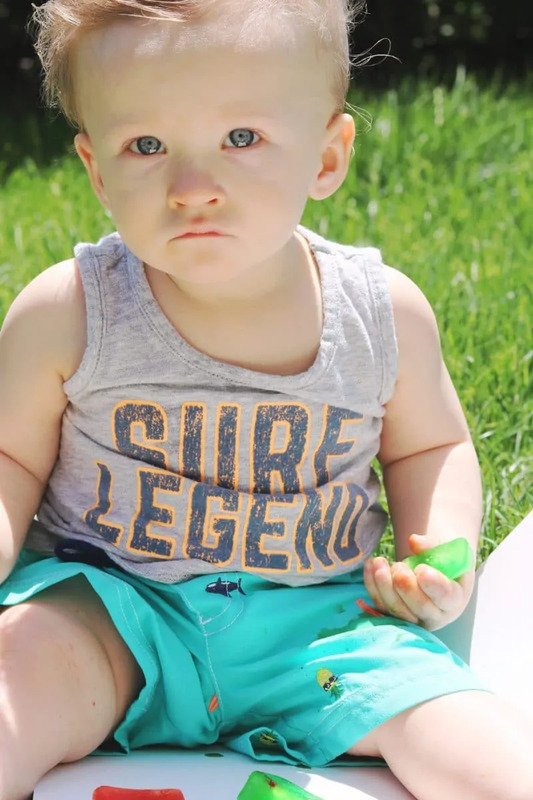 I take sun protection seriously, especially when it comes to my baby's sensitive skin. This ice cube activity is super easy to set up, and low cost as well. First, gather your supplies. Let's take a look at what you will need. 1. 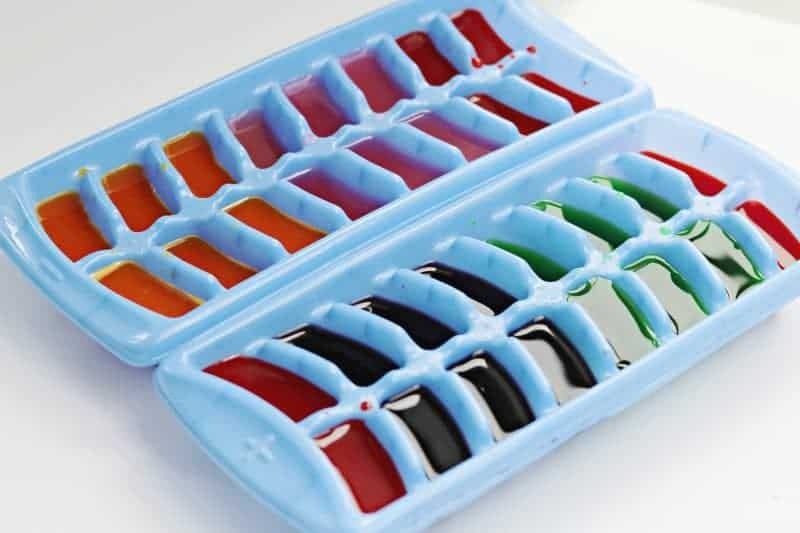 Mix various flavors of powdered drink mix with water and then fill your ice cube tray(s). 2. When you are ready for ice play pack up your supplies and head outdoors. 3. Place ice cubes on the poster board. Let your little one explore the ice cubes on their own. If they are hesitant you can demonstrate by showing them how you play with the ice and use the ice cubes to “paint” on the poster board. 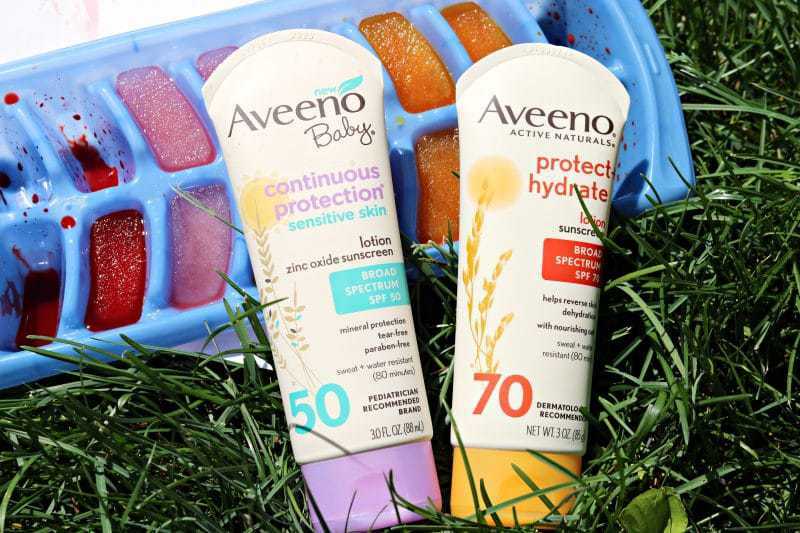 Don't forget to pick up Aveeno® Suncare products for yourself and your children to prepare for fun in the sun this summer. 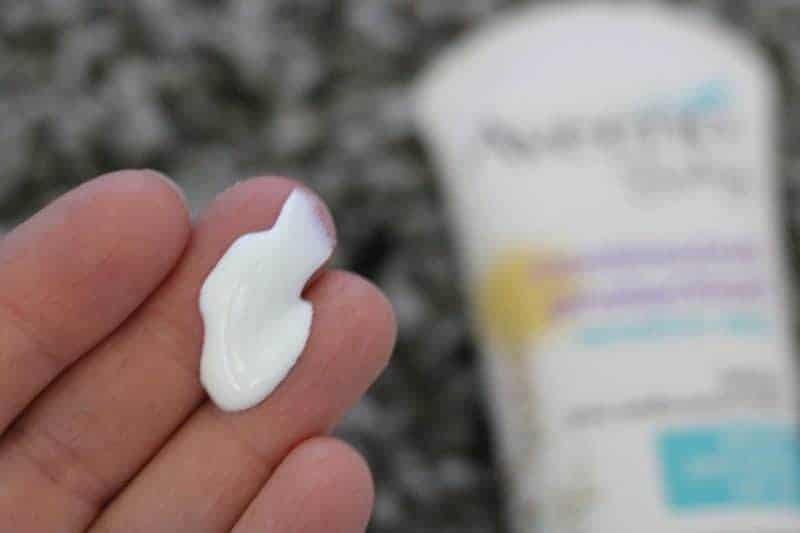 My sunscreen of choice is dermatologist recommended AVEENO® PROTECT + HYDRATE® Lotion Sunscreen with Broad Spectrum SPF 70. I like how it keeps my skin hydrated all day long while protecting me from the sun's harmful UVA/UVB rays. The oil-free, noncomedogenic formula is made with Active Naturals® Colloidal Oatmeal which works to soothe my skin and leave it feeling soft and smooth. 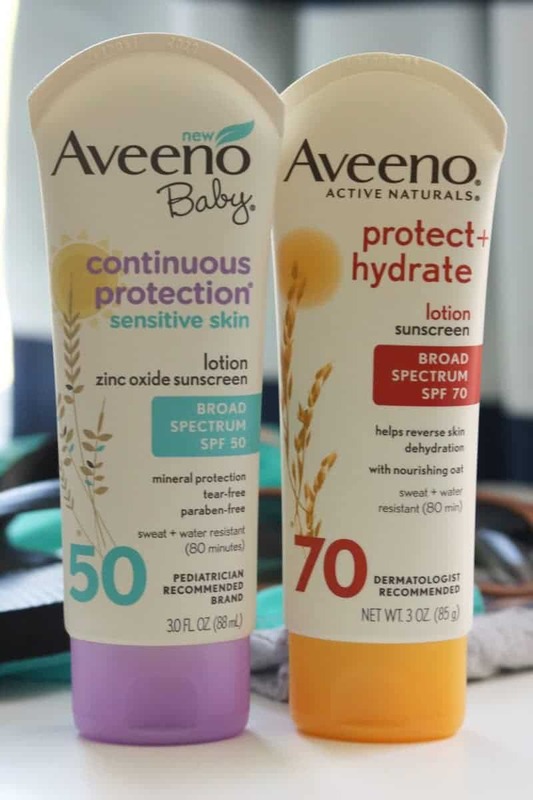 When it came time to choose a sunscreen for my son, I was happy to find that Aveeno® make a sunscreen for babies as well. 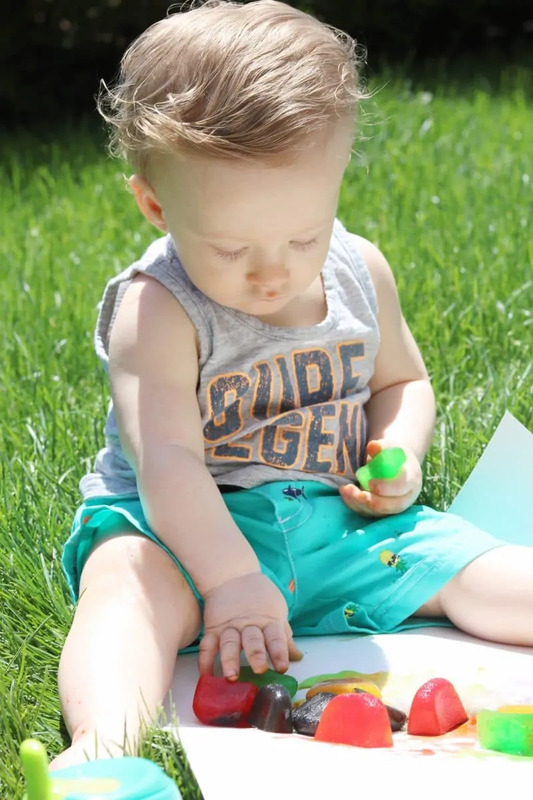 Since I have had such a positive experience with Aveeno® Suncare products myself, they were my first choice for my son as well. 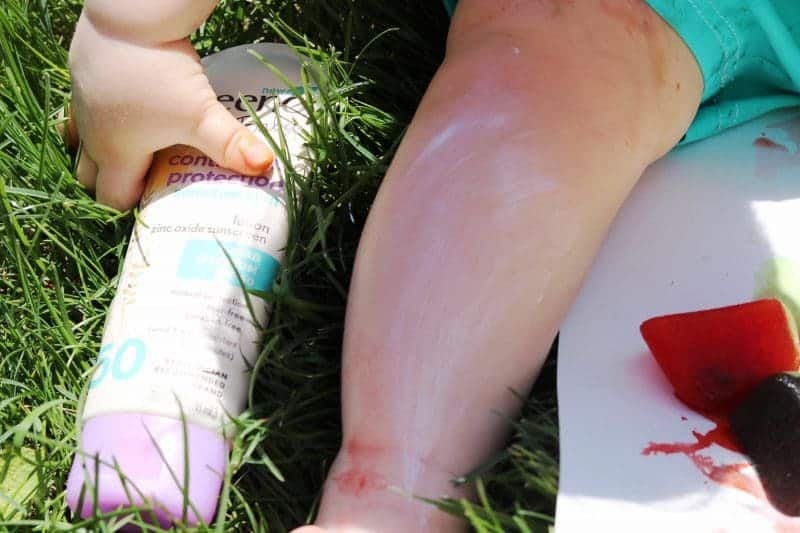 And once I learned that Aveeno® Baby Continuous Protection® Sensitive Skin Zinc Oxide Sunscreen SPF 50 is recommended by pediatricians and dermatologists alike, it was obvious that Aveeno® was the right choice for the little guy. I love that Aveeno® Baby is formulated with babies' delicate skin in mind. The tear-free formula is free of all dyes, fragrances, parabens and phthalates, In fact, it is shown to be as gentle as water. The formula is lightweight and non-greasy. It blends easily into baby's skin, leaving skin feeling soft. Buy 1, get 1 50% off Aveeno® Suncare at CVS now through June 2, 2018. I picked up our Aveeno® Suncare products at my local CVS to take advantage of the great deal. 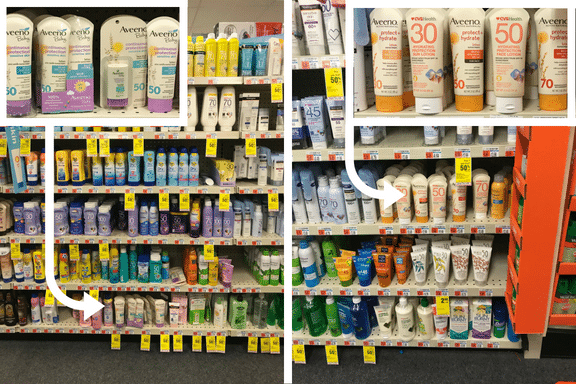 In my CVS location I found a small shelf of sunscreen in the beauty department but also a larger selection of sunscreens in the seasonal section near the beach gear and pool floats. For more information on this Aveeno Suncare promotion, visit CVS. 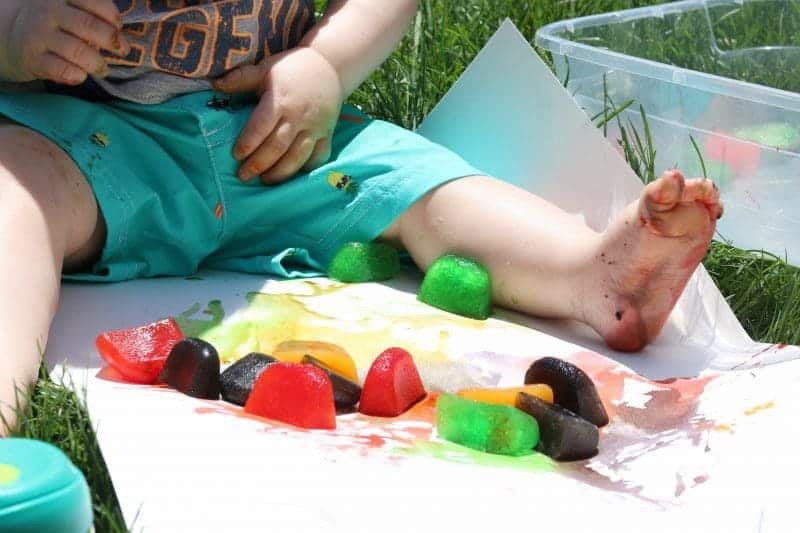 If you decided to try this colored ice cube activity with your little one I would love to hear how it goes in comments below. I am saving this Article for my baby coming in July! I never would have thought to do this. What a cute way to cool off this summer! What a fun idea. I don’t have babies anymore but that would have been a perfect idea for them. Babies first painting! Aveeno products are a staple here at our house, one of our daughters would get sunburned often if we didn’t use it. I’ll need to do this with my grandkids this summer. Looks like a lot of messy fun. So fun! That looks like a great outdoor, summer activity for the little ones. What a fun activity for summer! Such a cute baby. How fun! It keeps them cool and let’s them play with colors.